An opposition supporter returns a teargas canister fired by police during clashes in Kibera slum in Nairobi, Kenya October 26, 2017. 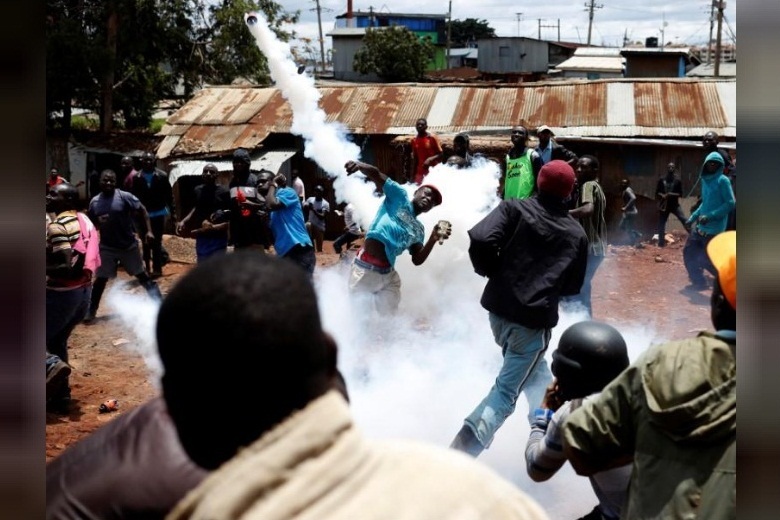 KISUMU, Kenya - Kenyan opposition supporters skirmished with police and threw up burning barricades in pockets of the country on Thursday, seeking to derail President Uhuru Kenyatta’s likely re-election with a low voter turnout. The election commission said the majority of polls had opened but voting would be delayed until Oct. 28 in four of Kenya’s 47 counties - all in the opposition-supporting west - due to “security challenges”. Wafula Chebukati, head of the election commission, said counties where voting would be delayed included Homa Bay, Kisumu, Migori and Siaya. But residents were skeptical. “We have seen you, we know you and we have marked you,” a group of opposition supporters shouted at voters outside a polling station. Four armed police were on guard at each station - double the number on duty last time. Kenyan opposition supporters skirmished with police and threw up burning barricades in pockets of the country on Thursday, seeking to derail President Uhuru Kenyatta’s likely re-election with a low voter turnout. The election commission said the majority of polls had opened but voting would be delayed until Oct. 28 in four of Kenya’s 47 counties - all in the opposition-supporting west - due to “security challenges”.